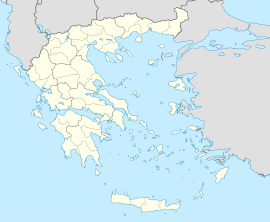 Nea Ionia (Greek: Νέα Ιωνία, meanin New Ionie) is a northren suburb o Athens, Greece, an a municipality o the Attica region. It haes a surface train station (ISAP). The suburb wis namit efter Ionie, the region in Anatolie frae whilk mony Greeks migratit in the 1920s follaein the Population exchynge atween Greece an Turkey. It is locatit northeast o the neeborheid o Patissia. It is locatit S o Attiki Odos which opened in 2001 an wisna fully connectit till Februar 2004, WSW o Kifissia an W o Kifissias Avenue, W o Marathonos Avenue, ENE o Athens an E o Kifissou Avenue. Its main street is ane connectin Patissia an Kifissia. The aurie wis made up o fermlands an trees dominatit the aurie. The trees are in the squares thir days. Urban development replacit hintle o the fermlands. Thir days, hintle o the municipality is urbanisit while the businesses are alang its main roads. Mony o the trees are aligned wi the streets an in squares. A few tracts o hilly gresslands lee tae the east. Nea Ionia haes schuils, lyceums, gymnasia, banks, a post office an squares (plateies). This page wis last eeditit on 5 Mairch 2018, at 00:52.